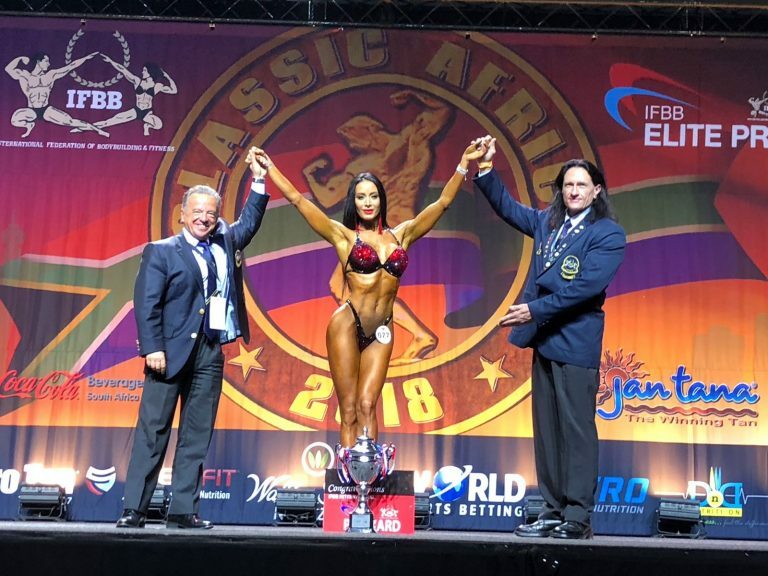 Continuing with her Gold Medal at the Arnold Classic South America (Brazil) and the 2018 European Championships (Spain), the fantastic Russian athlete Oksana Oleynik won the Overall Title, in Bikini Fitness, at the Arnold Classic South Africa that it´s been held in Johannesburg, until 20th May. This victory gave her new points for the 2018 IFBB World Ranking, becoming a solid candidate not only for the Top 10 but as well for the podium. Picture, IFBB President Dr. Rafael Santonja and the chairman of the South African Judges Committee, Bernd Groenewald; with Oksana Oleynik.